The resurgence of Circassian identity in recent years faces daunting obstacles. Many Circassians believe that the long-term sustainability of their community requires a return to the northwestern Caucasus, but both the Russian state and the other peoples of the region resist such designs. 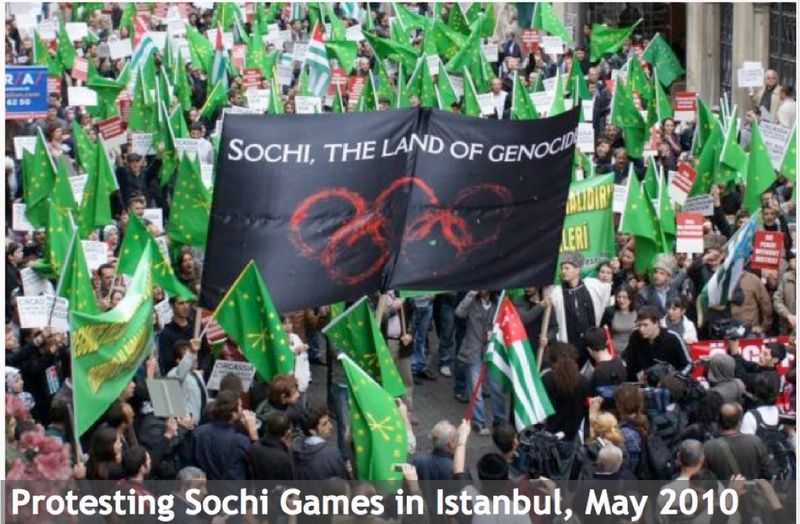 Circassians are thus focusing much of their efforts on global public opinion, building a protest movement in preparation for the Sochi Winter Olympics of 2014. Requests by Circassian exiles to return to the Caucasus began to pour into Russian consulates not long after the expulsion of the community in the mid-1800s. Until the downfall of the Soviet Union in 1991, however, re-migration in any numbers was not feasible. In the early 1990s, however, thousands of Circassians from the Middle East managed to move back, although some later abandoned the effort, discouraged by the poverty of the region. Return migration slowed after the war in Chechnya heated up in the mid 1990s, and was again constricted in the early 2000s by the imposition of restrictive Russian laws. Would-be immigrants must abandon their foreign citizenship and learn the Russian language. Quotas are imposed as well. Local opposition by non-Circassians also inhibits the movement. The “Union of the Slavs,” founded in 1991, seeks to forestall any return, warning others that the Circassian returnees plan to overwhelm the region and then marginalize local Russians. The Union has also fought proposals to increase the autonomy of the existing Circassian-oriented Russian republics, only one of which, Kabardino-Balkaria, actually has a Circassian majority. 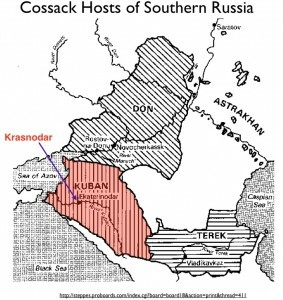 Cossacks have long been at the forefront of the anti-Circassian movement. Cossacks—Slavic-speaking people who had adopted the semi-nomadic lifestyle of the steppes—were instrumental in the expansion of the Russian Empire, and the northwestern Caucasus was no exception. The Kuban Cossack Host, established on the edge of Circassian territory in the late 1700s, figured prominently in the Russo-Turkish (and Russo-Circassian) wars. During this long period, local Cossacks borrowed extensively from their Circassian enemies. Even the uniforms of Kuban (and Terek) Cossacks are a form of the traditional Caucasian garb known as “chokha.” Historical emulation, however, did not entail peaceful coexistence. When the Tsarist government decided to clear out the Circassians in the 1860s, the Cossacks were in the vanguard. Their assaults usually began with the mass theft of horses—according to a local adage, “a Circassian and a horse together cannot be defeated”—and ended with the burning of villages and the expulsion of the people. 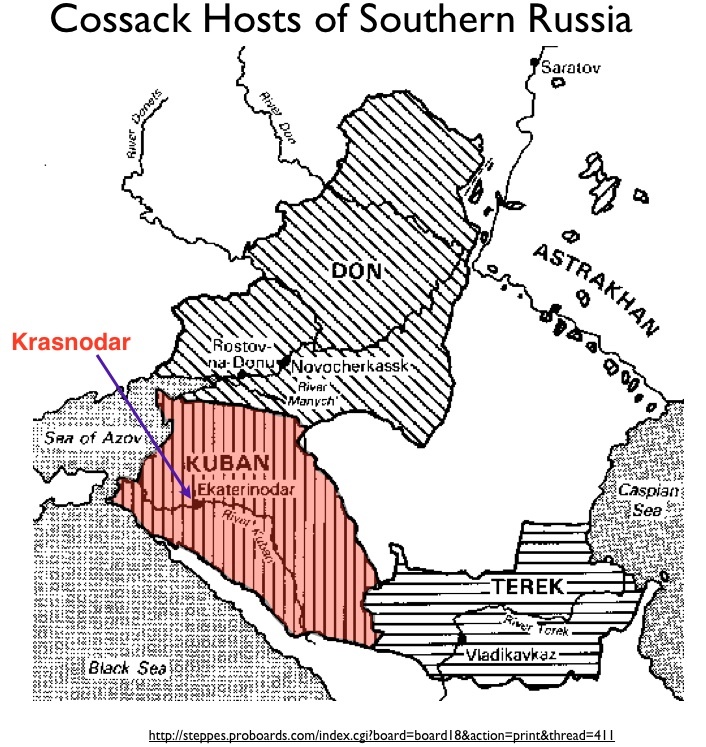 As a result, Cossack communities acquired some of the best lands in the northwestern Caucasus. Circassian activists have sought to enhance group solidarity by diminishing the differences among the various Circassian sub-groups. The Russian state has long divided the Circassians into four categories: the Kabardins, the Adyghe, the Cherkes, and the Shapsugs. (Three of these terms are reflected in the names of the three “Circassian,” or partly Circassian, Russian Republics: Republic of Adygea, Kabardino-Balkar Republic, and Karachay-Cherkess Republic.) 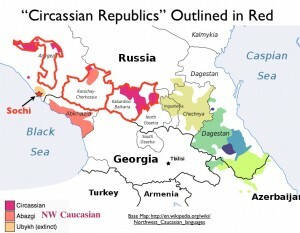 Members of the Circassian community increasingly insist on the ethnonym “Adyghe” for the entire group, and they hope for the eventual unification of the Circassian parts of the three republics. A related movement involves the quest to craft a new literary trans-Circassian language, as currently two standardized official languages, Kabardian and Adyghe proper, co-exist within a broader continuum of local dialects. The drive for unification encounters a potential snag in the Abazas and especially the Abkhazians. These peoples are historically and linguistically linked to the Circassians, but have generally been regarded as separate groups. Over the past several decades, the general tendency has been to try to fold all of the indigenous peoples of the northwestern Caucasus into one broad ethnic or national formation. More recently, however, tensions have mounted between Circassian and Abkhazian nationalists. 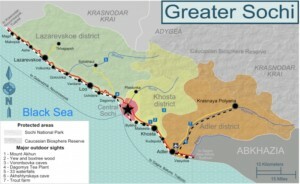 Abkhazia is now a self-declared independent country of its own that functions as a client state of Russia, and Russia is seen as the main obstacle to Circassian unification. A recent article suggests that tensions have arisen between Circassians and Abkhazians over Krasnya Polyana, the main skiing facility of the 2014 Winter Olympics. Some Abkhazian politicians have evidently claimed that Krasnya Polyana is rightfully Abkhazian, while Circassians view it as a monument to their own tragic history, the site of the last major battle in the Russian-Circassian war. 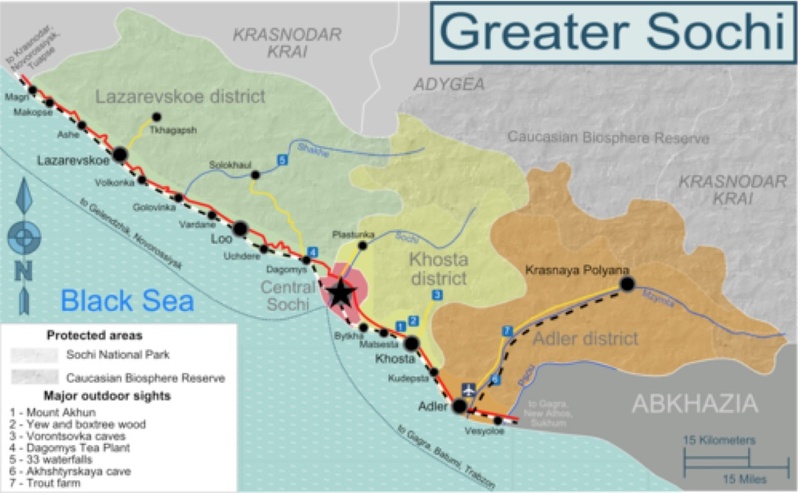 In one sense, neither view is fully correct: before the expulsions of the 1860s, the larger Sochi area had been the home of the Ubykhs, the one northwestern Caucasian people to disappear entirely in the diaspora. Circassian nationalists differ in their ultimate goals. Some demand nothing less than an independent Circassia blanketing the northwestern Caucasus, but others would be content with political and cultural autonomy within the Russian Federation, coupled with a right for members of the diaspora to return. Even these more limited aspirations, however, face long odds. 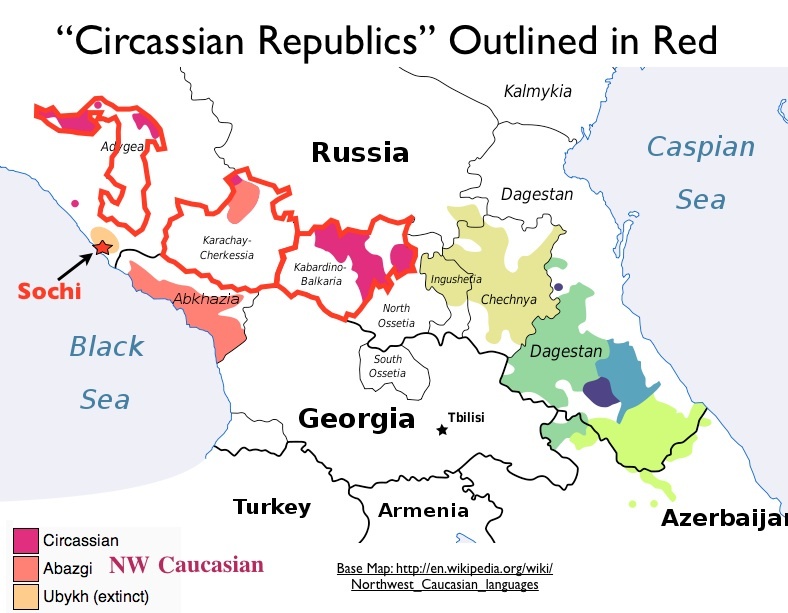 The three nominally Circassian republics all have limited autonomy, two are officially shared with non-Circassian groups, and all include many Russians and other non-indigenous peoples. Such diversity makes for complex local politics, which often devolve into three-way struggles among Russians, Circassians, and Turkic groups such as the Balkars. 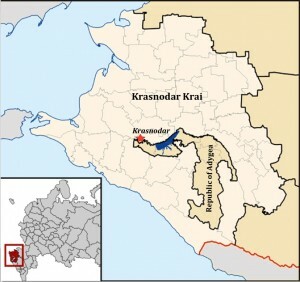 Russian activists have tried to dismantle the nominally Circassian Republic of Adygea, situated near the middle of Krasnodar Krai. Circassian officials in Adygea subsequently attempted, without success, to annul the immigration quota for Circassian returnees, hoping to bolster their own numbers in the fragile republic. Although their national ambitions face deep challenges, the Circassian community possesses many resources of its own. The diaspora includes many influential and wealthy persons. 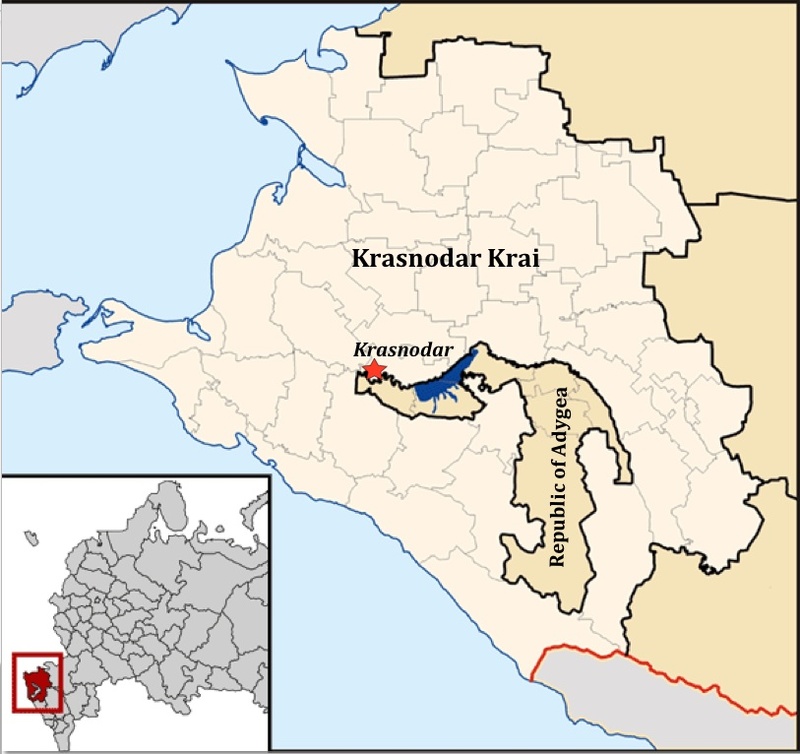 The proposed merging of Adygea and Krasnodar Krai, for example, was forestalled in part by the lobbying of Jordanian Circassians. The Circassian internet presence, moreover, is extensive and impressive, conveyed by many websites and YouTube productions. Yet as the lessons of “Virtual Tibet” show, it is extraordinarily difficult to translate internet activism into real political clout when faced with the concerted opposition of a powerful state. Despite the sophistication of the Circassian outreach program, their cause has hardly penetrated into the consciousness of the global community. I doubt that one person in a thousand in the United States has any knowledge of the Circassian people. But I do anticipate an upsurge in both information and interest as the 2014 Winter Olympics approaches. 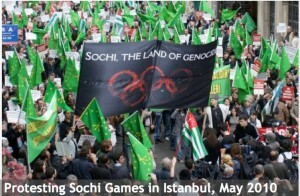 Circassians view Sochi and especially the ski resort at Krasnya Polyana as the focal points of their tragic history, and they are already denouncing the upcoming “Genocide Olympics.” Sizable demonstrations against the event have occurred in Istanbul and other cities, and more are on the way. Olympic competitions have long served as theaters of political demonstration, and the Sochi event promises to be particularly theatrical. Protests against the Sochi Olympics will likely draw on historical themes and motifs associated with the Circassian people. Although the Circassians are little-known in the West, that was not always the case. In the late 1800s the group was so famous that it inspired brand names, as we shall see in Monday’s post, the final offering on the Circassians.